This bromo tour package is cheaper because without Jeep transportation facilities, you are required to walk from your accommodation to Mount Bromo. Mount Bromo Tour Package Without Jeep might be a bit tiring but for those of you who like to travel on foot this will be more fun. For travelers who are already in the city of Yogyakarta and want to continue their vacation to Mount Bromo we have a cheap package that suits backpacker tourists. Go to Probolinggo city using an air-conditioned minibus and join other participants. We do not recommend that you go see the sunrise on the view point because of the long distance. Please see the sunrise from above the Bromo Mountain Caldera. The tour starts from the city of Yogyakarta, picking up at the hotel around 7.30 a.m. by minibus. Pick-up times will vary depending on the location of each participant's hotel. The trip to Probolinggo will take around 12 hours if there is no traffic jam. The driver will stop at the restaurant and toilet. After arriving in the city of Probolinggo, stop briefly at our representative office to listen to a little briefing and wait for the other participants to go to the hotel in the area of Mount Bromo as you ordered. 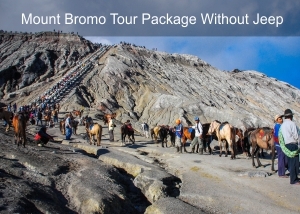 Because this tour package is without a Jeep, so you are required to go to Mount Bromo by walk on foot. For those of you who like hiking tours it might be easy and fast, it's about 45 minutes from your hotel in Cemoro Lawang. Please adjust the time you wake up to watch the sunrise from the top of the Mount Bromo caldera. You should go down and return to the hotel at 7 am for breakfast and take a short break before pick-up. Pick up at 9.30 am at your hotel to the representative office in Probolinggo. From this office you will take the next transportation to Mengwi Bali bus terminal or to another city by public bus. Facilities : Bed and sharing bathroom. Facilities : Breakfast, private bathroom.